So first, ***SPOILERS***, do not read on if you don't want to read a major spoiler about Star Wars: The Last Jedi. Okay, it's been out for several weeks now but better to be safe than sorry! Also quick disclaimer before going on, these are just my thoughts around the issue, I've got a PhD in astrophysics and have written about this stuff before (e.g. http://astrojje.blogspot.co.nz/2016/07/science-of-sci-fi-spaceflight.html) read and watched more sci-fi than I probably should have and completed X-wing, TIE fighter and X-wing alliance, again, more times than I should have. So I do love Star Wars and really like thinking not of the problems with science fiction but with "how could they possibly happen". But over doing the washing up I realised something, we've seen starship/starship collisions before. For example in Rogue One, https://www.youtube.com/watch?v=BZMepnUqpo8 where the collision between two Star Destroyers was "bad" for those ships. 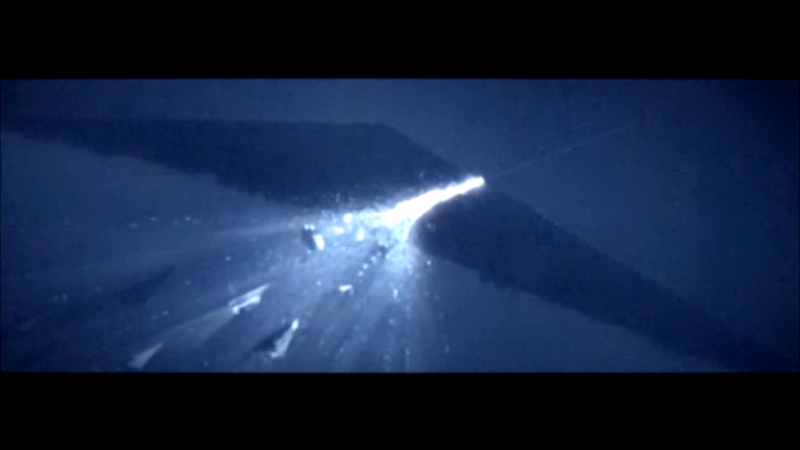 Then even in Return of the Jedi there was the collision of a tiny little A-wing with a super-Star Destroyer (https://www.youtube.com/watch?v=lbsIUX2LoJQ). In both these cases the velocities weren't at "hyperspeed" but the collisions were still bad. In the latter case mainly because of the collision hitting the bridge of the Executor. A lot of people seem to have latched onto the fact that the Holdo Maneuver is the first to occur at light speed. However when you look at the damage to the mega-ship, it doesn't look so bad. The ship didn't suddenly explode it was just cut through. This looks quite similar to the star destroyer-star destroyer collision but at higher speed. So here is the sciency bit - why did Admirial Holdo go to lightspeed? It was to make the collision happen quickly rather than allowing time for the First Order to move out the way. The energy of the collision wasn't enhanced due to the lightspeed it was just the time of the collision changed. This fact suggests the hyperdrive in the Star Wars Universe doesn't warp space but time? Or both maybe? So how it allows an object to travel the same distance that would take minutes at sub-light speed in a fraction of a second. Thus when the cruiser collides with the First Order ship rather than taking minutes or seconds as we've seen before it takes fractions of a micro-second. The trailing wake of material from the explosion is then what hits the other destroys behind the mega-ship. Another sciency thing her is that it means by the way that the hyperdrive doesn't remove a ship from spacetime like say the TARDIS does in Dr Who. But it means that there must be a similar solution, that we don't know of, that is how to "disconnect" one bit of spacetime from another, change the passage of time in someway and then "reconnect" them later without problems (this is impossible in our current understanding of the Universe). Anyway the good news is this removes some of the problems what people have pointed out about the collision, namely "why did no one think of doing this before?". Well first, they have, just not with the hyperdrive engaged. Also let's think about this, a cruiser is an expensive ship, even if it's really old and ready for scrap, using one up as a weapon wouldn't be cost effective. There are many better (more cost effective) weapons that could be deployed. Summary: the hyperdrive didn't add destructive power, it just meant the collision (which we know already to be destructive) to just happen much more quickly. There are other things to bear in mind here why no one developed "hyperdrive suicide robot ships". I think this comes down to cost and how difficult it is to build hyperdrives. The original TIE fighters didn't have hyperdrives or even shields. Even in the prequels the jedi starfighters needed to hook up to a special hyperdrive attachment. Hyperdrives are probably either expensive or difficult to make, if they don't add any destructive power it is probably more cost effective to put your money into making a bigger bang for your bomb. Also then there are the safe guards that hyperdrives have which stop you if there is a large mass nearby. (I've played X-Wing, TIE Fighter and X-wing Alliance and have died in a mission many times when a star destroyer has blocked my exit vector, grrrrr). But you can always override them because as the article above points out, and suggestions in cannon dialogue gives you a "bad feeling" about collisions in hyperdrive. One last thought though, if the hyperdrive does change time somehow, it means there might be some equivalence between distance and time taken to travel that distance, there might only be one speed of hyperdrive. This means that when in "A New Hope" Han Solo talks about doing the Kessel run in 12 parsecs, that has some direct meaning to time, not necessarily time, although that's still a complex and loaded statemtent. Anyway, don't panic, we didn't see any new destructive tactic in "The Last Jedi", just a way of speeding things up. I believe the hyperdrive enhanced the collision energy by A LOT, but the main reason is some info that you might be missing: the Supremacy's dimensions are roughly 13 x 60.5 x 4 km, while the Raddus is 3.4 x 0.7 x 0.5 km. So a ship 3 km long cleanly sliced through a path of about 10 km, creating total disintegration on a width that on the trailing end is several times wider than the Raddus was. The debris had so much remaining energy that not only contributed to the destruction but also annihilated several star destroyers along the line. In Rogue One we had two Star Destroyers of the same size and mass colliding, and in RotJ the destruction only involved the Executor's bridge, while the scene in The Last Jedi is much more out of proportion.